UEFI (Unified Extensible Firmware Interface) is a replacement for the BIOS (Basic Input/Output System) used by most IBM-compatible PCs. Much more detail can be found on Wikipedia's UEFI Page or at the Unified Extensible Firmware Inteface Forum. 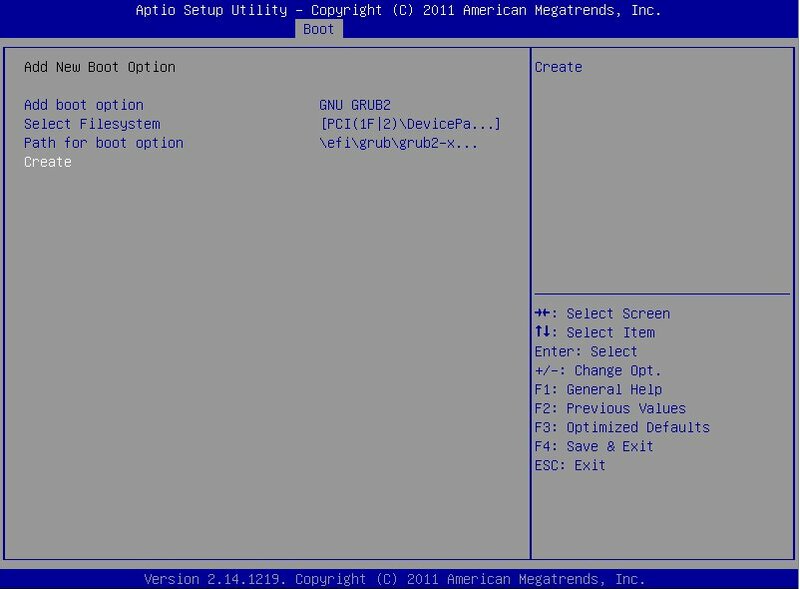 This document details how to boot CRUX using UEFI. CRUX 3.2 and later support native UEFI installation. More detail about boot loaders can be found in the later "Boot Loaders" section of this page. While the UEFI specification supports both MBR (msdos) and GPT disk labels, GPT is the preferred choice. Some manufacturers' (HP's, for example) UEFI implementations will not boot a UEFI system from an MBR-partitioned drive. If dual-booting with Windows it's important to note that Windows also requires a GPT disk label to boot in UEFI mode. In addition to the usual partitions created during an install, an ESP (EFI System Partition) is required. It should be formatted with a FAT12, FAT16, or FAT32 filesystem. It doesn't need to be very large, just large enough to comfortably house whatever UEFI executables (and in the case of loaders like GRUB2, modules/helpers) are needed. A few common sizes for the ESP are 100MiB, 32MiB, and 128MiB. On this example system the ESP is 128MiB in size. It was formatted using dosfstools' mkfs.fat program with no special arguments. While the ESP in this example is the first partition on the drive, that is not a hard requirement of the UEFI specification. Microsoft does recommend it be the first partition for Windows installations so keep that in mind if dual-booting. This option is only required if EFI stub support is desired in lieu of one of the more traditional boot loaders. See the EFI stub notes in the "Boot Loaders" section below. NOTE: This option can be builtin (<*>) or module (<M>). If you build it as a module, be sure to load the 'efivarfs' module before attempting to edit UEFI boot entries. Please note that some of these options can technically be compiled as modules but it is NOT recommended due to the extra requirements that adds such as an initrd or initramfs to load the GPT partition support and EFI frame buffer early. The string section between parentheses should be populated with the proper command line boot string. Without this specified the system will most likely NOT boot! The above string is correct for the example system used here. NOTE: /dev/sdXY is the ESP. NOTE: GRUB2 does NOT require kernel/initrd/initramfs images to be located in the ESP! The grub-install utility will install the UEFI executable into the ESP and add a grub entry to the UEFI boot order using efibootmgr. It will NOT automatically create a config file for you (it used to do this in the past). NOTE: This means you can skip the 'EFI Boot Manager' section below. If preferred, a grub.cfg file can be constructed manually but that's beyond the scope of this document. See the GNU GRUB Manual for more information. If the system in use does not ship with a UEFI boot option manager in the setup utility or for some reason an alternative is needed/desired, use efibootmgr. It's a command-line utility that displays, creates, alters, and deletes UEFI boot options. NOTE: Some systems have an EFI shell application, some do not. It is not used in this document. # efibootmgr -c -l "\efi\grub\grubx64.efi" -L "GNU GRUB2"
As shown in the output above, efibootmgr created a new UEFI boot entry with id 0000 and label "GNU GRUB2". More detail can be seen using efibootmgr's -v option if desired. Note that efibootmgr also set BootOrder to 0000,0007 which means that the new entry was automatically placed first in the boot order. Also note that efibootmgr's -d and -p options were not specified because the defaults (/dev/sda for -d and 1 for -p) were valid for the example system. The path specified with the -l option is relative to the root of the ESP's filesystem rather than the main Linux root filesystem and backslashes are used instead of forward slashes. In the above example the -d and -p options were explicitly specified. This example created a UEFI boot entry with id 0000 and label Linux 3.11.6 EFI Stub. The compiled kernel image was copied (by the user, not efibootmgr) to the ESP's filesystem as "vmlinuz-3.11.6.efi" in a "/efi/linux" folder structure. The ESP in this case is the second partition of the second disk (/dev/sdb2).